(when paired with an oil, electric, or gas system) to save on energy and fuel. 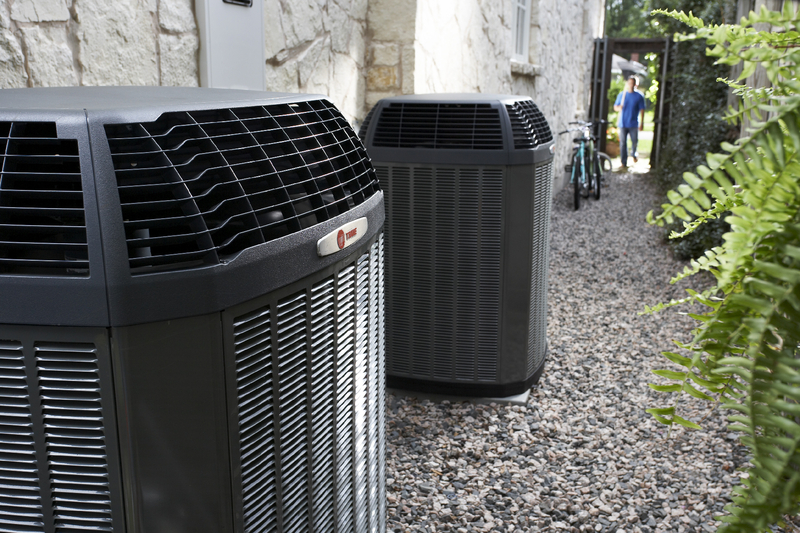 Heat pumps are identical to an air conditioner, but are much more efficient and offer significantly more savings! A heat pump is an outdoor unit that uses a compressor and cycles refrigeration - similar to an air conditioner - but is designed to reverse that cycle to heat or cool a controlled space. However, rather than creating heat, heat pumps extract heat from the outside air (even when temperatures are extremely cold outside) and transport it through your home's duct work and into your home. When used for air conditioning purposes, heat pumps remove and displace the heat from inside the home to make the indoor temperature cooler. Heat pumps operate exclusively on electricity, and because they don't generate heat, they are extremely efficient. Even though a heat pump can provide warm temperatures as the primary heat source, it does require the use of a backup system (gas, oil, or electric central forced air systems) if temperatures reach below 25 degrees- this way the efficiency remains high but the edge is taken off if temperatures dip below freezing. 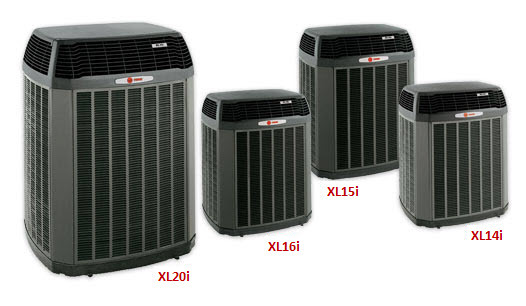 Trane offers a variety of heat pumps that range in efficiency (from 14 SEER to a 20 SEER units) and features, including the Weather-Guard top that can only be found on select Trane Heat Pump and Air Conditioning products. These Weather-Guard tops are specifically designed to keep pine needles, leaves, branches (kids find ways to keep busy in the backyard!) and debris out of the outdoor unit fan. Not only are they functional, but they look great too! How Do You Choose The Best? Choosing the best equipment means selecting a reliable brand and a reliable Portland heat pump repair, installation and maintenance contractor from Able Heating and Cooling. Most contractors are out the door once the installation takes place, leaving the job only 90% complete. However, at Able Heating & Cooling we make sure to check the airflow, run the equipment in all modes, check the temperature rise in each cycle, and make sure everything is running smoothly before we leave the home. And, once a year passes, we like to come back to perform a 20 Point Precision Tune Up on the equipment to ensure your new system is running properly and efficiently. How do you choose the most reliable brand? Determine the success of the brand in the market. For example, Lifestory Research compares hundreds of heating & cooling equipment in the market to determine which earns the title of America's Most Trusted® HVAC Brand. 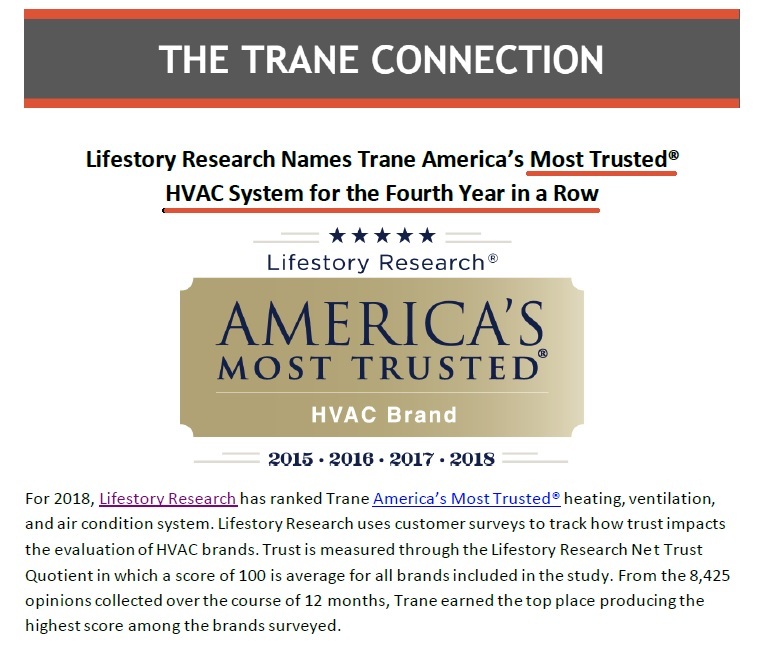 In January 2018, they honored Trane as America's Most Trusted® HVAC Brand for the 4th year in a row! If you are ready to see how much you and your family would benefit from a Trane heat pump system, give us a call today and we'll schedule a time for one of our Home Solution Advisers stop by and provide you with a few solutions! You can reach us by phone at 503-579-2250, or email: info@ableheatingandcooling.com.